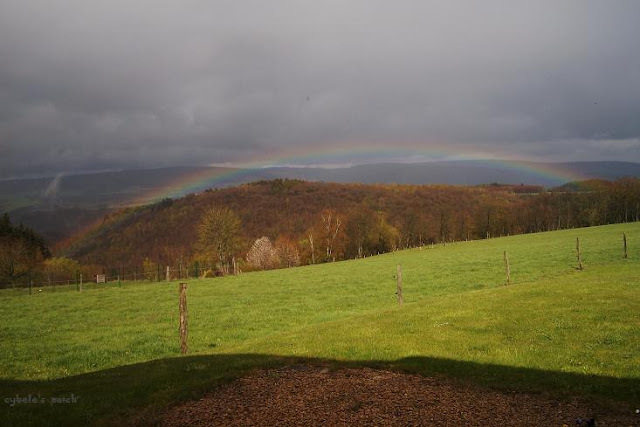 While staying in the Belgian Ardennes a few weeks ago we had days and days of rain with a dark and gloomy sky. After three days the sky opened for a few seconds and surprised us with a beautiful rainbow very close to the house we stayed. It was gone before we got to the pot of gold. So close to it and no luck! More wonderful sky photos are just a click away. Ah, I know the feeling. I've had them rise right out of the meadow in front of me but they can be as shifty as rabbits and always keep ahead of you. Never mind about the 'if only', at least you got a lovely shot to remember your stay by. It didn't get better ! we have a roller coaster weather ! But I haven't seen such a beautiful rainbow ! Fantastic shot of the rainbow over the beautiful scenery. Great view of the field with rainbow. Wat een schitterend foto´s deze site kenden ik nog niet van je.